This page displays examples of projects that we have completed. 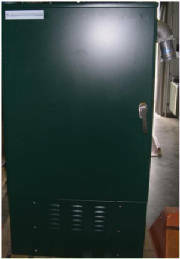 The quadraplex pump control panel provided control for two 27hp pumps and (2) 47hp pumps. 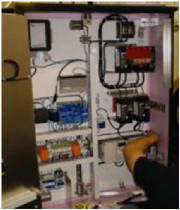 The panel also featured VFD drives, a Sensaphone 1800 Monitoring System, and a 1500ct Pump Controller. 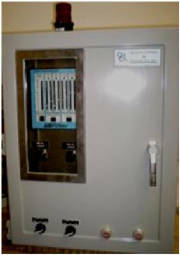 The duplex pump control panel provided control for (2) 10hp pumps. The panel featured VFD drives and an LC150 controller to aid in this operation. The alarm controller was constructed as a means to provide an easy access alarm shutoff control, as specified by the contractor. 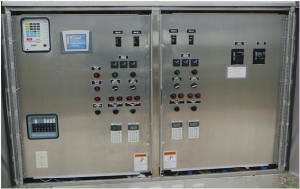 A Duplex pump control panel for controlling (2) two 10hp pumps with LC150 and CB1T control was constructed by QCI. In addition, QCI has made additions to other panels with the addition of 1500ct pump controllers and RTU upgrades to various liftstations. All aimed at increasing ease of use while increasing capacity and quality. QCI completed two panel modifications including an addition of the 1500ct Pump Controller to one of these rebuilds. QCI also produced a Duplex grinder pump control panel for controlling (2) 2hp submersible grinder pumps in a pump down mode of operation. Panel rebuilds can improve longevity of current liftstations while reducing the costs accosiated with constructing a new panel. Liftstation control panels, sludge pump clarifier stations, and workstation controls represent some of the many products and features of QCI. QCI replaced motorstarters with VFDs, produced two liftstation control panels, a sludge clairifier pump control panel, improved a multitude of workstations, and improved server functionality.